Panasonic SC-NE3 review | What Hi-Fi? 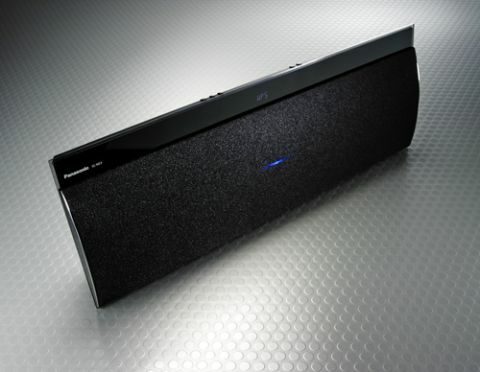 The Panasonic SC-NE3 wireless music speaker looks as if it will give the Cambridge Audio Minx Air 100 (and 200) a run for its money as the most well connected wireless speaker. With AirPlay, Bluetooth and DLNA streaming on board, the Panasonic system looks a treat for a competitively priced £250. We’ll be honest: there’s not a whole lot we can say in favour of the Panasonic SC-NE3’s sound. While its large build means that the sound travels far and wide in a room, the sluggish delivery, poor detail definition and lack of composure means there’s hardly any engagement no matter what you listen to. Whether streamed via Bluetooth or AirPlay, voices sound muffled and restricted, while instruments are muddled – there’s no clear separation between notes and the listless timing does nothing to move the song forward. Despite having the capacity to go quite loud, the SC-NE3 starts to strain at higher volumes, and what little composure it has starts to unravel. Overall this speaker sounds confused and messy compared with price rivals such as the JBL OnBeat Rumble or the Sony SRS-BTX500. Predictably for wireless speakers, the 3.5mm auxiliary input offers a more solid and clearer sound, with a hint of cohesion creeping in to make songs more listenable. Amanda Palmer’s Guitar Hero has more weight and drive, but the midrange is plagued with poor insight and doesn’t convey the raw power and emotion behind Palmer’s vocals. A touch of liveliness is afoot when playing WAV tracks from a laptop, with Oasis’s Roll With It charging ahead with a touch more clarity and agile timing. In its attempt to show a bit of vigour, though, the SC-NE3 can end up sounding rather shouty and noisy. Switching back to Bluetooth produces an obvious drop in detail, but that smoothness can be easier to listen to. Happily, there is scope to tweak the sound settings on the Panasonic SC-NE3. Alongside adjusting the bass and treble levels, you also have the choice of four EQ modes. We’d suggest you set it on ‘Flat’ for the clearest and best-balanced sound; the default ‘Heavy’ setting makes the unit sound even more sluggish and bass-heavy, while ‘Clear’ is slightly too sharp on the ears. We also found that setting the surround mode to ‘Level 1’ made the soundstage more open and inviting; turning it off completely made the sound too small and insubstantial. Interestingly, Panasonic has designed the SC-NE3 to be wall-mounted. However, we’d strongly advise against placing the SC-NE3 close to a wall or corner, as the sound loses its openness and sounds boomy and closed-in. Yes, even more so. Give it space and vocals are immediately livelier and clearer. You’d be forgiven for thinking the SC-NE3 is a soundbar, as it is rather larger and bulkier than the trendy wireless speakers dominating the market. Its innocuous design doesn’t grab your attention compared with more stylish competitors such as the B&W Z2, Libratone Zipp or even the compact Sony SRS-BTX500. The build quality is sound, though, with control buttons hidden away on a sloped back panel. The most useful feature is the SC-NE3’s display, which clearly states which connection is in use and the various menu settings. At the back is the power connector and the 3.5mm input – it’s worth noting there’s no USB port to charge your mobile device, though. The main attraction point of the Panasonic SC-NE3, of course, is its variety of streaming options. Along with AirPlay and Bluetooth, you also have the option to connect DLNA-compatible storage devices over your home network, and stream directly from an iOS device or iTunes without a wireless network. You can toggle between Bluetooth and auxiliary inputs via the button on the unit or remote control. Setting up AirPlay is a bit more complicated than the quick Bluetooth pairing, and you’ll need the Panasonic Stereo System Network Setup app to connect the unit to your home network. You’ll first have to use the remote control to head into the network set-up menu, and then follow the instructions on the Network Setup app downloaded on to your mobile device. If all goes well, the flashing purple light in the middle of the unit should turn into a steady blue when connected. An accompanying ‘Success’ message reads on the display, while a rather dispiriting ‘Fail’ display shows up if otherwise. It took us two tries to get AirPlay set up successfully – you’ll be fine as long as you have a stable home network connection (and a bit of patience). Alternatively, you can set up direct streaming without the hassle of wi-fi connection by turning ‘D Connect’ on in the SC-NE3’s menus, and simply inputting the displayed password on your smart device when prompted. It’s almost as quick as Bluetooth pairing, and we found it to be a little more stable than networked AirPlay. The supplied remote may be small, but it’s responsive and much nicer to hold than most tiny, credit-card-sized remotes. It’s vital when setting up AirPlay, and to access the menu for various set-up operations and software updates. You can also access sound settings via the remote, and can toggle shuffle or repeat options when in AirPlay mode. We can see it being used on a daily basis for changing the SC-NE3’s volume. There is the option to download the Panasonic Music Streaming app (free for iOS and Android), through which you can access your smartphone or tablet’s music library. The playback controls largely mimic your smartphone’s own music player’s interface, so it does feel a tad redundant. However, it is useful for accessing songs stored on a DLNA-connected device, such as a NAS box or computer. Take note: you can play WAV and MP3 files only when streaming over DLNA. We’re rather disappointed with the performance of the Panasonic SC-NE3. The breadth of streaming options at hand did excite us, and its set-up is logical, if somewhat layered. However, its poor sound quality makes it very difficult to justify spending £250 on this speaker when there are far more talented and enjoyable wireless speakers to be found on the market at a similar price. When you have speakers such as the Geneva Model S Wireless DAB+, JBL OnBeat Rumble and Libratone Zipp, it’s hard to find a reason to recommend the Panasonic SC-NE3.